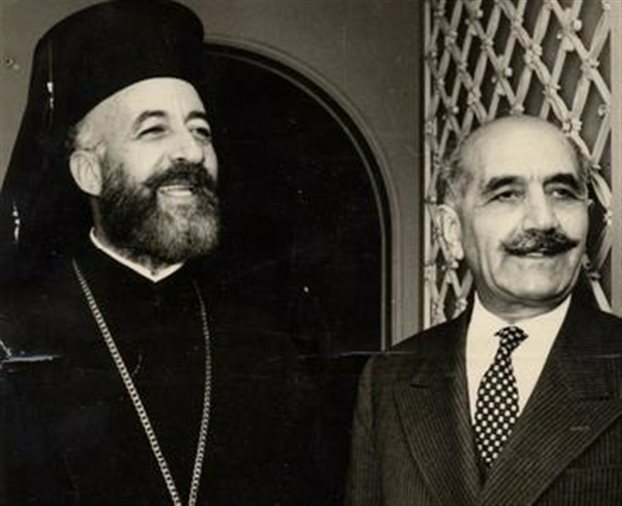 from the right is Georgios Grivas (sitting). It was the 1st of April 1955, 63 years ago, when the National Organisation of Cypriot Fighters, known by the acronym EOKA, began its armed guerrilla struggle aiming at the union of Cyprus with Greece. EOKA was a nationalist, deeply anticommunist organisation. The plans for its creation had already began in 1950, with the active support of the Greek bourgeois class and the consent of Archbishop Makarios. The organisation's leader was the notorious nationalist, known for his anticommunist sentiments, Georgios Grivas. It is characteristic that during the Nazi occupation of Greece in 1940s, Grivas had founded and led the "X" far-right guerrilla organisation, which was mainly made up by officers of the bourgeois Greek army. 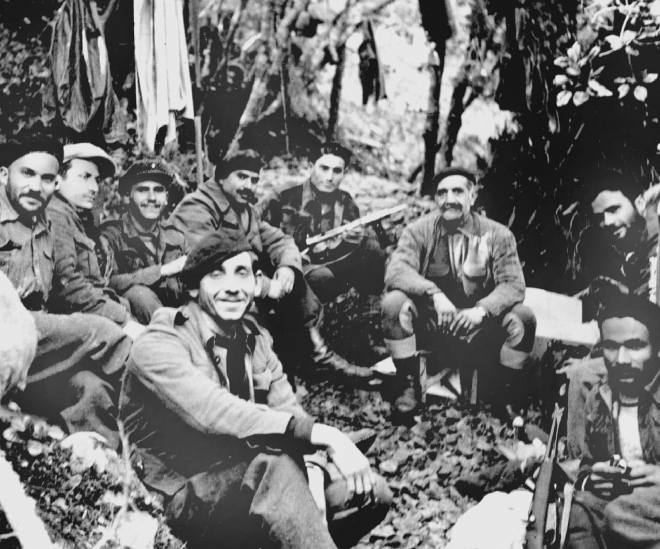 During the December 1944 events in Athens, members of the "X organisation fought alongside Greek bourgeois forces and British imperialists against the EAM-ELAS popular movement. EOKA was made up by ex-members of the "X", based on its organisational model. Despite the fact that EOKA's declared goal was the ultimate "liberation of Cyprus from the British yoke", it has been revealed that the founders of EOKA had connections with the British intelligence agencies. EOKA was never based on mass armed struggle. On the contrary, it was a small organisation of a few hundred members- mainly high school students and young men in their early 20s. Despite the depiction of EOKA as a popular anti-imperialist revolutionary organisation by the bourgeois Greek and Greek Cypriot historiography, the truth is that EOKA never aimed at a really mass popular struggle against the British. The deep enmity of Grivas towards Communists and Turkish Cypriots overshadowed EOKA's supposed "anti-British" character. The primary enemies of the organisation were the Greek Cypriot Communists (members and supporters of AKEL) and the Turkish Cypriots. There are numerous documented attacks against member of AKEL, leftists, trade unionists and Turkish Cypriot citizens organised by EOKA's leadership. During the night between March 31st and April 1st 1955, EOKA members launched the first sabotages and attacks in the cities of Nicosia and Larnaca. A few hours later, in a statement AKEL was talking about "provocation hidden under the mantle of national action", pointing out that such activities could only damage the cause of the Cypriot struggle. The same opinion had been expressed by the KKE through a message of its General Secretary Nikos Zachariadis. The activity of EOKA, as well as the one of the Turkish Cypriot nationalist paramilitary organisation "Volkan" (which was later evolved as TMT), contributred the strengthening of nationalist enmity between Greek Cypriots and Turkish Cypriots. This enmity was exploitated by British imperialism, as well as by parts of the Greek and Turkish bourgeois classes, towards the achievement of their own strategic plans.